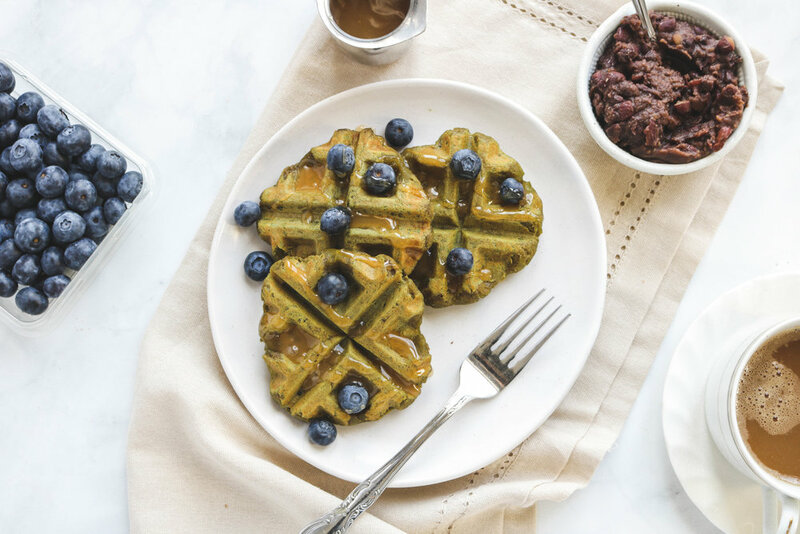 These Matcha Mochi Waffles (aka Moffles) are crispy on the outside and chewy on the inside. 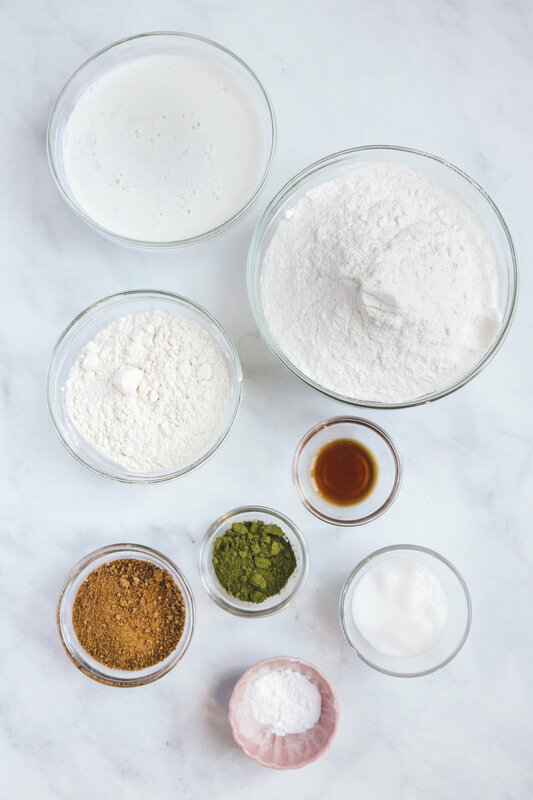 So easy to make and only required 7 ingredients! So... truth be told I’ve never really been a waffle or pancake breakfast person. Growing up, I’ve almost always preferred toast, cereal and grill cheese. Aside from the occasional egg-o’s, I’m not a avid waffle eater. But BOY have I been missing out?! I recently got a waffle maker from my mom and wanted to put it to good use. I’ve tried a couple of vegan waffle recipes but meh, they were okay. They either had a strong banana flavour, were quite gummy inside or the outside wasn’t crisp enough and kind of limp… not a fan. I like my waffles to have an edge, a crisp edge. Oh, and I also like my waffles to be soft, moist (but not raw) with a bite. I was most definitely inspired by my Matcha Mochi Donuts for this recipe. It’s baked, has a crisp edge and is nice and chewy on the inside. Perfect, I took the base and switched up a couple things… and after a couple trials I nailed the perfect ratio! I went for Matcha because I’ve been on a serious matcha and mochi kick lately, but you can totally switch up the flavours easily. Matcha Mochi Waffles require only 7 ingredients! It’s as easy as mixing all the ingredients together and scooping some into a waffle maker to let it do its magic. I love to top my waffles off with berries because they stick inside the little pockets so they don’t just all fall off the place after each bite. 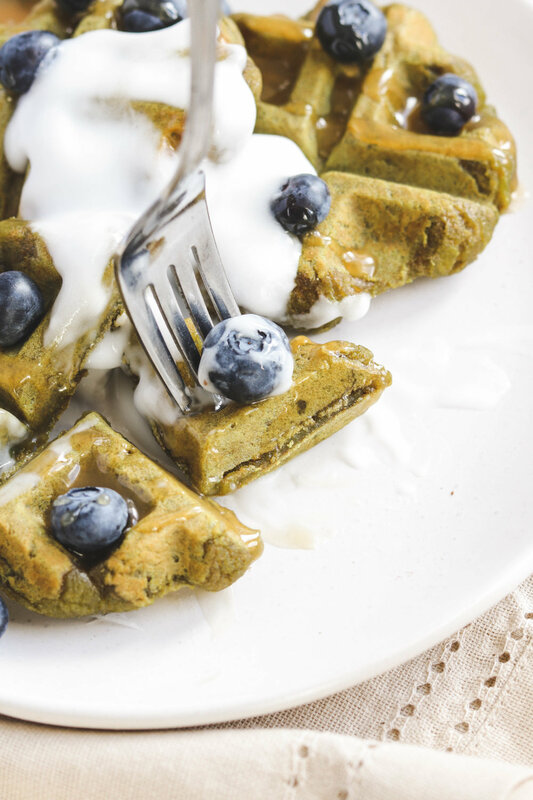 Oh and these matcha mochi waffles are even better with some caramel sauce and fresh coconut yogurt. & a delicious take on your traditional waffles! If you recreate these Matcha Mochi Waffles please share it and let me know what you think by tagging me on Instagram @lisakitahara, I love seeing all of your tasty recreations! Serve immediately with fruit, yogurt, whip cream or red bean paste!